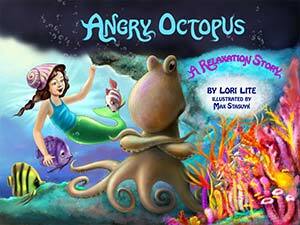 I was browsing the net for some books that help children deal with their anger n temper when I came up this book; Angry Octopus by Lori Lite. "Children love to unwind and relax with this fun exercise known as “progressive muscular relaxation”. 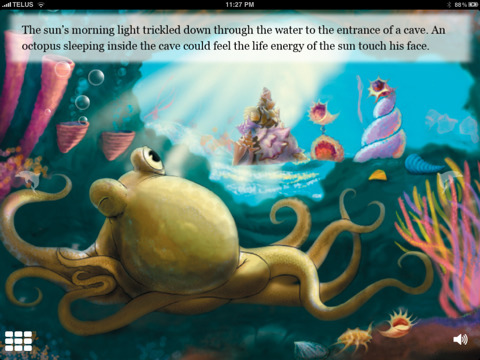 Children relate to the angry octopus in this story as the sea child shows him how to take a deep breath, calm down, and manage his anger. This effective stress and anger management technique focuses awareness on various muscle groups to create a complete resting of the mind and body. Muscular relaxation can lower stress and anxiety levels. It can be used to decrease pain and anger. This engaging story quiets the mind and relaxes the body so your child can let go of anger and fall asleep peacefully." The many reviews in various site by many readers who bought this book to help their kid(s) or little patients (they are doctors, psychologist :P) are good. Thus I decided to give it a try. Plus I like the colorful pictures (saw the preview in amazon.com). Its bright colors should attract Little DinoEgg to sit down and listen to the story. I got this book today and couldn't wait to read it to Little DinoEgg. We sat down at our Reading Time and I started to read it to him. The story started with this page, give us a feeling of calmness, serenity, peaceful, the feeling of waking up fresh n happy in the morning. This already sets us in our relaxed n calm mood, we snuggle to get us into a more comfortable position while I read on. The words the author uses are very expressive. When I read it, I feel that I am the Octopus getting pent up, frustrated and angry, then feeling the energy going out of my body, releasing the tight feelings in my chest out from my mouth then finally feeling calmed n relaxed. We follow what the Sea Child told the Octopus to do, Little DinoEgg find it so much fun! Curling his toes, tucking himself into a ball, squeezing his face etc etc. At the end of the book he was giggling and laughing away and wanted me to read the book a second time! This book is great for both kids and adults. Inside the book, the author wrote "Follow the Octopus along as he learns to calm down as he relaxes his mind and body. Notice how he learns to be the boss of his own feelings, body and anger." Sometimes we forgot how to relax and kept our frustrated feelings inside us. We inevitably vent our anger on our loved ones, which are no good. Learn how to be the boss of our feelings, body and anger. We will be a better person n have better relationship with others.